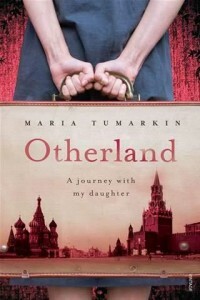 I first heard of Maria Tumarkin’s memoir, Otherland (Random House, 2011) on Stuart Beaton’s blog, http://rastous.podomatic.com, when he interviewed her while she was in Beijing for Australian Writers’ Week this month. A day or two later, I read about her again when Shannon Young blogged about hearing her speak at the Shanghai Literary Festival. I’d visited the Soviet Union a month before it fell, so was interested to read about Tumarkin’s return to Russia and Ukraine decades after she left the USSR for Australia in 1989 at the age of 15. Tumarkin decides to take her 11 year-old (soon to be 12) daughter, Billie, back to the former Soviet Union to show her where her family came from. So with the help of her parents (who watch Tumarkin’s toddler son, Miguel, back in Melbourne), mother and daughter set out on a five-week journey ‘home’. But Russia and Ukraine aren’t–and weren’t–the same home as experienced by her friends still there. Before they left in 1989, the Tumarkins were labeled as Jews in their passports and on the class rosters at school. Tumarkin explains how some families tried everything to get out of that label, but her parents thought it was important not to lose sight of who they were. Ironically, being Jewish in the Soviet Union in the late 70s and throughout the 80s was actually a good thing. It was during that time that Soviet Jews were allowed to emigrate en masse to Israel, the US, and Australia. But as Tumarkin would learn, some of her friends back in Ukraine, where she grew up, felt resentful that Tumarkin left for a brighter future. But who could have predicted how Russia and Ukraine would fare a few years later, after the fall of the USSR? It was for these reasons–being a Jew in the former Soviet Union, the people who stayed back, the way the countries turned out after the mismanaged transitions to a free market–that Tumarkin wanted Billie to experience where her mother had grown up. We also learn about Tumarkin’s parents’ backgrounds and how her mother was born in Uzbekistan during the war (and how her family was lucky to be in the right place at the right time during the horrendous Babi Yar massacre close to where Tumarkin’s mother’s family lived). Her parents and grandparents believed in the Soviet Union, but eventually realized it wasn’t what they wanted for their children. So they left when they could. Besides a memoir of return, Tumarkin’s book is a short history of the USSR during and after the war. She also brings the reader up to date with current social and economic issues in Russia and Ukraine. I wished she’d written more about her own past–and how she’d come to be the single mother of two children from two different fathers. That could be another book. This is the book I didn’t get the chance to read before the interview – I wish I had, it sounds great. Maria was fantastic to talk to, when she was in China for Australian Writers’ Week, and I hope that people take the time to listen to the interview and read her work – she’s certainly well worth it! Thanks so much for your comment and for introducing me to her memoir! I already know of a few people who have put “Otherland” on the top of their lists!